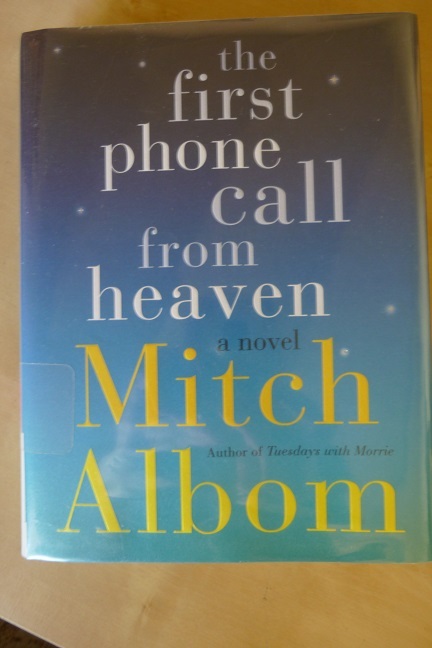 I don’t generally think of Mitch Albom when I think of authors I read–but when I do think about it, I’ve read and enjoyed a good bit of his writing. So when I heard he had a new book out, I got into the (long) library hold list for The First Phone Call from Heaven. I am happy to report that this is probably my favorite Albom book yet. In a small Michigan town, several residents begin receiving phone calls from deceased loved ones. All are deeply moved, and one feels compelled to share with her church community. Soon word gets out around town, and then around the country, turning into a media frenzy. The town becomes a pilgrim destination for believers and skeptics alike. One town resident, Sully Harding, a widower with a young son, is convinced this must be a hoax, and sets out to investigate for the truth. I love the plotline here, and how the story unfolds. It’s half inspirational and half mystery. One nice thing was knowing that Albom had written novels with fantasy/afterlife elements in them before, so it felt equally plausible that the phone calls could be real, or that they could be a hoax, so I was right along with Sully and the other characters in wondering. I won’t give it away, but I will say that I found the conclusion to be as satisfying and feel-good as I would have expected from Albom. There are a lot of characters, and it took me a little while to get everyone sorted in my head (Is this the one getting the calls from her mother, or the one whose sister is calling…?) The premise was strong enough to keep me engaged until I got more of the characters fixed. It did smooth out by the second half of the book, as the ensemble cast developed more individuality, and clearer paths they were walking. Most characters are individual portraits of grief, very moving while not being depressing. By the time you reach the end of the book, it becomes clear that each character has been on his/her own journey through the experience. If there’s one main character it’s Sully, but really this is an ensemble cast that ultimately has many messages about life, death and the people we love. As seems to be usual for Albom, this is a seemingly simple book, not very long, that is ultimately quite heartwarming. I, too, have enjoyed other books by Albom, so this one sounds like a winner. I will have to check it out. Thanks for the recommendation. I like his writing style – he writes about spiritual topics but not at all in a cloying way.